First brewed in 2011, this Chocolate Peanut Butter Porter is jet black in color with a tan, rocky head, full body and creamy, luxurious mouthfeel. Its lightly sweet, malty flavor is accented by rich flavors of chocolate, coffee and peanut butter, and balanced by a subtle hop character and moderate 6.5% abv. Sweet Baby Jesus finishes smooth, dry, and roasty with lingering notes of chocolate and peanut butter so savory, you will exclaim its name! This beer is another example of how people's taste buds must vary wildly, perhaps based on individual DNA. For me, the smell and the taste both made me slightly nauseated. While there WAS an odor of peanut butter and chocolate, I found it cloying. Right from that point, it was a bit of a struggle to take the first sip. With that first sip, and the few I took thereafter, my mouth involuntarily grimaced and my body actually briefly shivered. I can only blame myself. I bought this bottle - just the one thankfully - because the name cracked me up. A friend who had tried it previously warned me - but I figured what the heck? As I write this, the beer is sitting next to the keyboard looking all ominous. Of the 12 ounces, I think I have sipped through maybe 3. I can continue torturing myself by forcing myself to finish this to avoid the waste of the purchase price. Or I can pour it and just accept the loss. I just closed my eyes and inhaled from the glass once again, trying to be less biased. It smelled more of chocolate milk with a bit of peanut butter. But then opening my eyes and seeing this black ale again is making me feel vaguely sick. Obviously, a fair number of reviewers LIKE this. So, like most beers, it has hit the mark for some folks. But I cannot finish it. I just can't. The only other beer I have had to pour in recent memory was some horrible chile beer from Mexico. Honestly, I find this beer to be at least as bad as that was, and I never thought I would ever react so negatively to another beer after I tried that one. Kudos to the brewer, though, DuClaw makes some very fine brews! Normally, I really like "out of the box" experiments with beer styles and flavors. This one just didn't work for me. 12 oz bottle @ 45F poured into Nonic glass. Dark brown with ruby highlights and light tan head dissipated fairly quickly. Aroma of roasted peanuts--off to a good start! Body is a bit thin but not too bad for a porter. Well what do you know --it tastes like chocolate and peanut butter!!! ...and then the harshly bitter, artificial flavor qualities kick in!!! Can't take more than a few more sips of this. When I bought it I didn't know that artificial flavors had been added -- that's cheating in my opinion. Worse than that, it just tastes bad. My first non-infected drainpour...EVER! I've always finished my beer, even when it was nasty, because I had assumed that it had been made honestly. I can't say that in this case. After buying a single, I noticed all the negative reviews based on artificial ingredients. I emailed Duclaw wanting to know just what the ingredients were as this was concerning to me (as are GMO'S). They were kind enough to get back to me the next day. They stated that they "tweaked" the recipe a couple of years ago and artificial ingredients are no longer used in this beer. Thanks to tectactoe for this enticing extra, & had I known it contained peanut butter & chocolate, it would have vanished long ago. 12 oz. bottle from a brewery I've enjoyed every time I've encountered it. Pours is flat, deadly, cast-iron black, though the pan is rusting a bit around the edges. The nose is beautiful liquid candy. This might be the time to confess that I have a gigantic hard-on for Reese's Peanut Butter Cups which, if a low-cal version ever arrived on the scene, I might eat every meal. Lovely sweet malts, roast, & a low edge of peanut butter. I approve of this scent. Sweet Baby Jesus - what the hell does that have to do with the beer, anyways? Sharp, bitter roast knocks hard, too hard, actually, scaring the palate. Trying to extricate itself from the borderline coffee is an underlayment of peanut butter, sweet malts. Chocolate is too faint, but it's nice & creamy. Not tough to put down at all. Well, my dreams of drinking this all day while shoveling Reese's in my face has fallen sadly short. A pretty good beer, but I'd love to see more peanut & chocolate. This brew could be the poster child for the "Anti-Craft Beer" people. Pure gimmick. Too sweet, too fake tasting. Two sips in, and I'm feeling sick to my stomach from the cloying heaviness. Add to that an aftertaste that refuses to go away, and you have a perfect example of why some people laugh at the craft beer industry. This is my first, and last, Sweet Baby Jesus. I'm currently judging those who have recommended it to me. Poured from a 12 oz bottle into a glass. Look: Great dark color, nearly black. Tiny head that stuck around and got creamy after a while. Smell: Initially straight up peanut butter. Pleasantly interesting! Then it hit...a fake chocolate smell. Smells like a chocolate scratch-n-sniff sticker I had in first grade. Not a good smell. Taste: No peanut butter, a little toasty, lots of that fake, chemical-like taste. Part chocolate scratch-n-sniff sticker, part hot credit card. When that mixes with a lingering bitterness, something unpleasant happens in the aftertaste department. There might be a decent porter hiding under there, but I'm having trouble finding it. Mouthfeel: Medium body, fairly smooth, borderline cloying. Overall: Though the concept could work, this isn't it. I won't be rocking this baby again. Appearance-dark brown but can see through the beer when held up to the light. No head to speak of. Smell-the best thing about this beer. Smells like a peanut butter cup. Taste-artificial/chemical peanut butter taste and not much else. The PB dominates here. An astringent quality is present. Mouthfeel-thin beer, basically watery. The astringency/acidity can be felt on the tongue. Overall-a crime to call this a Porter. Roasted malts are weak, if present at all, no head, watery, artificial taste. If you want a "crafted" Porter grab a Samuel Smith Taddy Porter or Founders Porter. This reeks of mass production. Day 24 of the Craft Beer Advent Calendar. L: Dark brown but still see through with a slight brown head to it and a fair amount of yeast floating in the beer. S: Sweet caramel and brown sugar. F: Smooth and full body feel, super good. 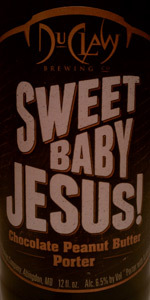 DuClaw Brewing Company Sweet Baby Jesus is an amazing tasting beer, to say the least. We had this bad boy at another Christmas/Holiday week parties we went to. This was a great party. Everyone exchanged a 6 pack of craft !!!! Now back the Sweet Baby . Dark brown porter. Smells of a yummy chocolate, coffee and peanut butter filled the air. The taste is outstanding. The feel is some what velvety / creamy. A nice tan foam from the immediate pour . With all of that said, I am a huge fan of DuClaw, and this one does not disappoint. If you like chocolaty porters, it's worth trying ! Another good one from DuClaw, in my book! It's like a dark chocolate Reese's in liquid form. Very good. Bottle or on tap, this never fails, though I do recommend this on tap over bottle. Pours a dark brown, on the edge of black, with a tan head that has gravitas. The nose is a little chocolate and char and a TON of peanut butter . The peanut butter is prominent on the taste, with some chocolate and a surprising stone fruit component that is a bit of a miss. I wish the chocolate played a bigger role in this beer, because I think it would be world-class if it did. Presentation: It was poured from a brown 12 oz bottle into a tulip glass. Appearance: The body is a very dark amber brown color topped off with a small soapy tan head. It’s head quickly settles down to a ring of foam at the edge of the glass with a wispy thin film in the center. Lacing is minimal. Smell: It’s big nutty notes hit me right as I opened the bottle. In the glass I get loads of sweet peanut butter and cocoa powder like notes. Taste / Palate: The flavor tastes just like a peanut butter sandwich covered in cocoa powder. Its sweet overall but not overly so. The feel is smooth and softly carbonated. The pour is true, black and slow. Light brown head, very thick and full. Great looking beer. The smell is fantastic, lots of peanut butter and some chocolate. Taste follows that, a Reese's in a bottle. Winter is coming, prepare accordingly. Pours a deep muddy brown, with a caramel colored head - good retention. Smells of peanut butter, chocolate, and malt. Taste is peanut butter followed by bitter chocolate rounded out with some faint coffee notes. It has an almost yeasty malt after taste. This is a solid Porter, but not great. Appearance – The beer pours a deep-deep brown color with a one finger of tan colored head. The head has a good level of retention, slowly fading to leave a moderate level of lace on the sides of the glass. Smell – The aroma of the beer is quite heavy of a roasted malt smell mixed with a whole lot of a milk chocolate aroma. Other sweeter smells of caramel and a rather potent showing of a roasted peanut butter smell also are in the aroma. A bit of coffee is there as well, producing an overall aroma of a somewhat drier peanut butter cup nature. Taste – The taste begins with a sweet milk chocolate taste with a moderate roasted malt and light coffee flavor. While little peanut butter taste is present upfront, it begins coming in soon after the initial flavors hit the tongue. All while this occurs, the sweeter flavors seem to get even sweeter with more milk chocolate and caramel coming to the tongue and with some of the coffee flavors dwindling. A little bit of a roasted bitter flavor joins the flavor at the very end of the taste leaving a nice and sweet chocolaty and moderately peanut buttery flavor to linger on the tongue. Mouthfeel – For a porter of 6.5 % abv. this one is a little on the thinner side with a carbonation level that is a bit on the higher side. For the sweeter milk chocolate and peanut butter flavors, a bit of a thicker body may have created a slightly better and more dessert like feel, but even said the higher carbonation was actually quite nice for the sweet flavors and made for a more easy drinkability in the beer. So with that the feel was fairly nice overall. Overall – A nice sweet chocolate peanut butter cup brew with a good drinkability and abv. If the body was only a little bit thicker this would be spot on for a dessert brew. Even so this is really a quite nice brew overall. Fabulous beer! Wonderful gutsy, deep flavor. Gorgeously dark. Smooth and rich with wonderful overtones. I think this beer is my all time favorite. I discovered it at a local Alamo move theater and am now wondering if I'm going to have to drive to Maryland to get more. Might be worth it! It sure makes drinking beer an exciting experience. Pours nearly black in color. The aroma is sweet and malty, with both chocolate syrup and peanut butter apparent in the aroma. The flavor malty and high in milk chocolate up front, with a HUGE peanut butter middle, finishing somewhat sweet and medicinal. The strong flavors of chocolate and peanut butter are pleasant enough to put any stray flavors to rest. I've been waiting for a peanut butter (stout) such as this to come along. Praise be to Sweet Baby Jesus! Ordered on tap at the Anthracite Cafe in Wilkes-Barre, PA. For the record, I had a pretzel sandwich with this brew and the pairing was actually quite good. Poured, it is a normal porter. Good, dark color and nice head. The smell is intoxicating and is truly the best part of this beer. It smells like chocolate and peanut butter with hints of cream and oat. The taste is all over the map for me. I am not necessarily saying it's a bad thing, but from a taste perspective, I feel there is too much too fast in this beer. You have the chocolate, the peanut butter and other flavors fighting for your attention, and they were at times too much. I think this would be a great dessert beer and I won't say I'd never order it again... but it's not at the top of my list. Appearance: Pours a jet black in color with a tan head. Overall: This beer has a roasted peanuts and chocolate aroma. Sweet flavor of roasted malt, chocolate and peanut butter with a dry, bitter, espresso finish. Very tasty, flavor changes and gets better with every sip. Don't tell the Reese's People! Bought solely because of the name. It amused me. Come on, Sweet Baby Jesus! How much more amazing can you get for a name? Unfortunately, all it has is a name. The chocolate is overwhelmed by the fake peanut butter flavor, and it just really doesn't work at all. There are no positives here. It is an offense to peanut butter, chocolate, and porters, and Sweet Baby Jesus wept. The peanut butter has an unfortunate staying power. I need to brush my teeth to get rid of the taste of the very few sips I had. Burial at sea for this one. First time in my life I have been conscious and failed to finish a beer. L: A bright, very dark brown to nearly black pour with ruby highlights kicks up a clingy tan 2” foam collar that takes 3 minutes to reduce to ¼ of its original size. S: A big peanut butter aroma seasoned with chocolate. Peanut butter, noticeable from at least 3 feet away dominates the aroma closely followed by chocolate. Hop aromas are low to none and malt aromas are medium low. T: Initial fruit flavors quickly give way to peanut butter, dark chocolate and a dose of dark malt. An assertive bitterness joins a lingering chocolate peanut butter finish that dries slightly. The peanut butter flavors are medium high, the chocolate and bitterness are medium, the malt and yeast flavors are medium low and the hop flavors are low. The flavors are well balanced with noting cloying or over stated. F: Medium full body, medium carbonation, no warming, a very slight grain astringency that adds balance. O: A surprisingly good well balanced beer. Overall: Fantastic brew... will gladly pick up more of this. It is a bit different of flavoring, but something I could drink every day.